Well, regardless if you are just a beginner trying to find the basic facts or already matured aficionado of “RV-ing lifestyle”, you are in the right place. 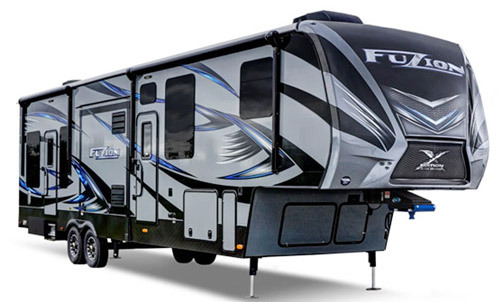 The bottom line is – on these pages you will find a lot of information about RVs and RV-ing like for example the presentations of top models of recreational vehicles in almost all their classes and sizes starting from smallest ones designed for motorbikes, through these towable by family cars, SUVs or HD trucks and ending with big luxurious rigs. For long the Tent Travel Trailers were some of the most popular campers among RV-ers. The main reasons are: affordability including reasonable initial cost, low operating cost (fuel efficiency and towability by most popular SUVs and minivans), low storage cost as well as large amount of sleeping space. But it all comes at the price of lower durability (prone to “wear-and-tear” and mold), vulnerability to weather elements, shorter season (difficulty to cool or heat), time-consuming set-up/pull-down time… to name the most important factors. 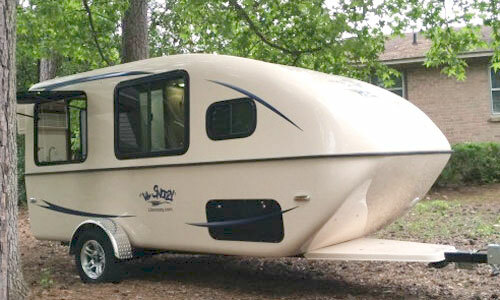 Although some of the newest Tent Travel Trailers can be quite well-equipped providing “close-to-residential” living environment, by definition (and physical limitations) they will be always on the lower end of “residentiality”. Indeed, they are much closer to the traditional tent camping experience then to the concept of “Home-away-from-home”. Hard-sides Travel Trailers cover the widest range of RVs in terms of sizes, features and prices. In this class of trailers at the low end you will find small and modestly furnished models with lengths in the range of 10ft, at the high end huge (up to 40ft long), lavishly finished models offering luxurious residential environment and obviously everything in between. These days the Hard-side Travel Trailers represent the most popular class of RVs given the fact that it reaches to very wide spectrum of customers. If you are concerned about towing capabilities of your car (and/or are “eco-oriented), you may look for models from lightweight series. 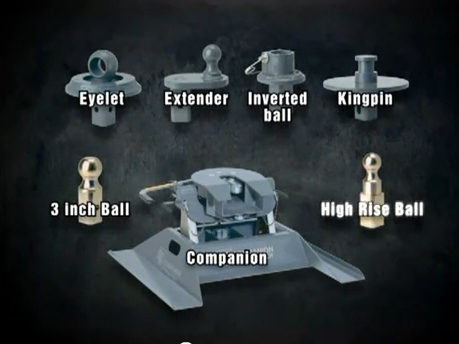 If durability and low maintenance cost is your major concern then you may consider all-fiberglass (molded) models. Nature lovers and adventurers exploring roads less-traveled may look for off-road models. 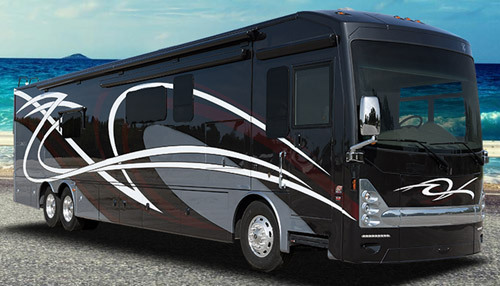 If RV-ing is part of your life-style, then obviously you will be interested in all-seasons models. Those with nostalgic feeling towards the “old-good-times” may consider retro models…. 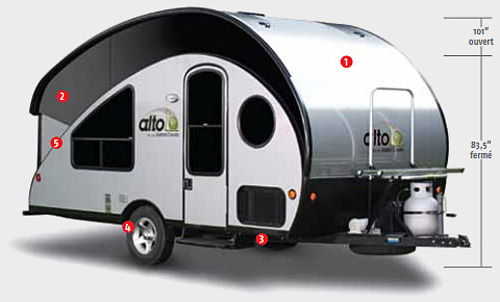 Well, when it comes to hard-side travel trailers, the choice is seemingly unlimited. In other words manufacturers did everything to make sure you can find model that fits into your dreams! 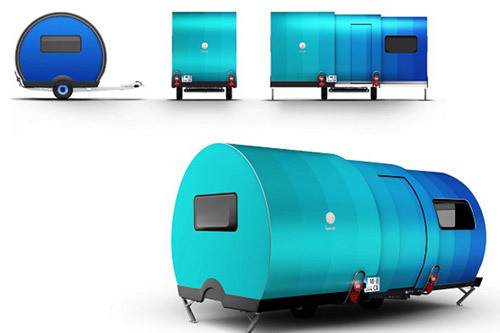 Hybrid campers combine hard-wall shell with pull-out tent end(s). Expectedly they offer some sort of compromise between the two mentioned above classes of RVs. Pricier, less aerodynamic and heavier than tent campers thanks to hard-wall shell they offer more “luxury” and better weather protection. They are easier to set-up (especially precious in bad weather conditions like rain and/or wind). Similarly as tent campers, they provide generous amount of sleeping space. 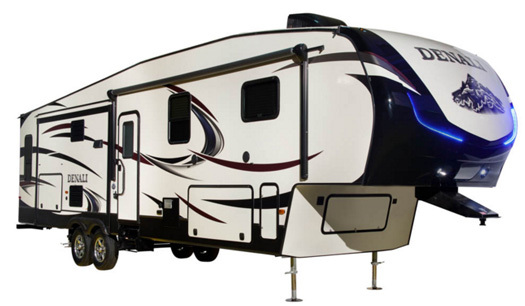 This relatively new class of RVs offers most advantages of small hard-wall travel trailers at the same time keeping most important benefits of pop-up travel trailers. They are light (so towable by most cars), offer great fuel economy (thanks to low profile in travel configuration), they are easy to store but in difference to tent travel trailers, they provide full weather protection. However, despite efforts to “fit” slide-outs into A-frame designs, these trailers are small. Nevertheless they may be great solution for young family of 2 /(2 with child) or seniors. 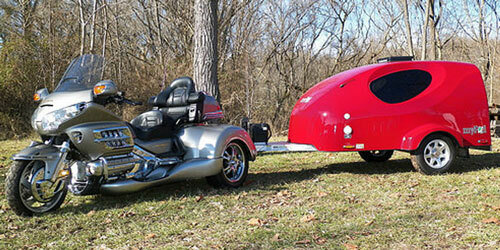 Traditionally 5th Wheel trailers are on the high-end of RVs. As they are designed specifically for (HD) trucks, they tend to take full advantage of their load and towing capacities. As a result it may be difficult to find small or even medium 5th wheel. In fact, most of available on the market models belongs to the family of large “residential-like” rigs. This class of RVs “fills-up” the room left at the lower-end of 5th-Wheels. Similarly as fifth wheels, truck campers are designed for pick-up trucks but not for towing, but for being carried in their beds. By definition (physical limitations), truck campers offer smaller living space and in general less of ”luxury”. However in difference to their big siblings, they are more affordable, easier to handle on the road and campground. Toy Haulers represent relatively new trend in RV-ers lifestyle. In simple words, they add to the traditional “Home-Away-From-Home” a Garage, giving you chance to hit the road in company of your favorite toys (ATV, Motorbikes etc..… ). For practical reasons, at the destination the garage can be converted into living space (dining room, bedroom, entertainment center etc..). 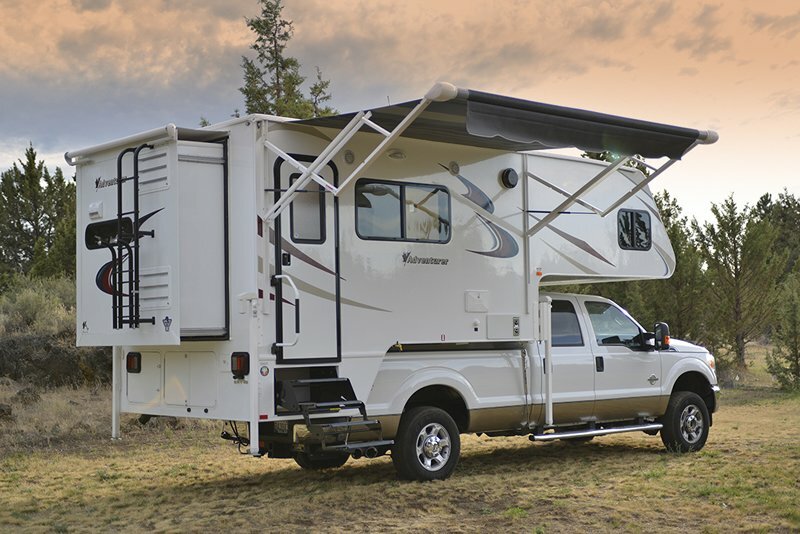 Usually Toy Haulers are built either as Hard-side Travel Trailers or Fifth Wheels (although recently an A-class Motorhome-based toy hauler was introduced on the market). Motorhomes belong to the category of self-propelled RVs. A-class models (usually built on HD bus chassis) are some of the most luxurious and expensive RVs. Large living space thanks to slide-outs, significant towing capacity (allowing you to take on the road your family car) make them real “Kings of the RV World”. But certainly, they are not for everybody and it is not only about the initial cost ($$$) and “gas-hungry nature”, but also due to such small “details” like category of your driving license. Class-B motorhomes (also known as campervans) are probably the most popular models. Usually modest in terms of standard features they are well symbolized by nostalgia-evoking VW Westfalia. Class-C motorhomes represent upgraded version of campervans. Their most characteristic element is an overcab sleeping area. It frees part of the interior allowing for more living space. Some models will also have slide-out substantially increasing the comfort. It’s a relatively old concept (1950’s) of a pop-up camper composed of two half-shells. The upper one fits over the bottom one during travel and then it is lifted-up for camping. This clever design offers advantages of hard-side trailers (weather-tolerance, thermal insulation, durability….). But at the same time it preserves benefits of “collapsible” RVs – in this case low aerodynamic profile, fuel efficiency and easy storage. During the last economic crisis, the manufacturer of Hi-Lo campers ceased operations. Fortunately, recently this great idea was “resurrected“ by Kerola’s Group and hopefully soon modern Hi-Lo campers will hit the roads…. See: --> Hi-Lo campers are back! 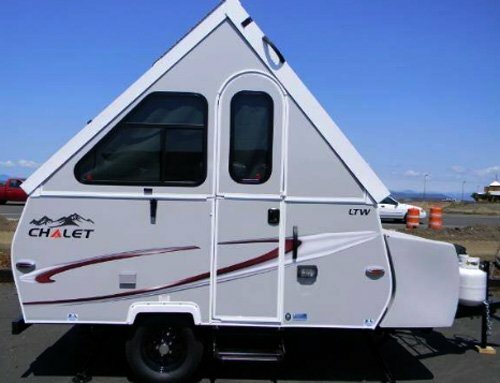 One of the best examples of truly unique RV designs is the TrailManor Travel Trailer. It consists of the bottom half-shell and two upper half-shells. 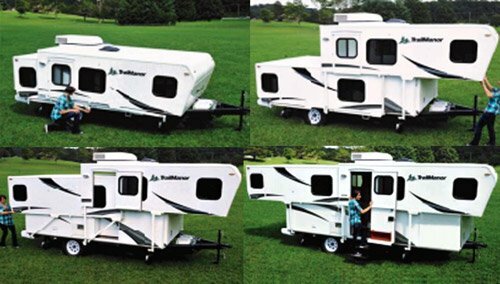 When collapsed (travel configuration) they all overlap together forming one box slightly higher than half of the height of the camper in its opened configuration. During the set-up process both upper shells are lifted-up (like in classical Hi-Lo camper), but in contrast with the latter they are also shifted toward the opposite ends of the bottom shell. The TrailManor combines fundamental properties of tent pop-up campers like low profile in travel configuration and over-end beds (not interfering with the living space). However unlike the tent trailers, it also offers weather-protected shell and large living space with all vital amenities. The BeauEr travel trailer is probably one of the most exotic RV designs. It is an “expandable” camper consisting of three modules (shells). They are overlapping each other in the travel configuration but at the touch of the button they deploy (expand) horizontally tripling the living area. The process is done automatically at the “touch of the button” by using electrical actuators powered by 12V battery and takes less than 20 seconds. The furniture in side modules (bedroom and living room) unfolds automatically. The center module includes basic amenities - galley and bathroom. Amphibious RV that can serve as a traditional camper on campgrounds and as a motor-boat on the water preserving in both cases the function of a “Home-away-from-home” since long was rather wishful thinking (if not dreaming) than the reality. Traditionally, most people that would like to “take the road” but also explore waters will pack their little boat either on the RV roof or pull it behind the camper. 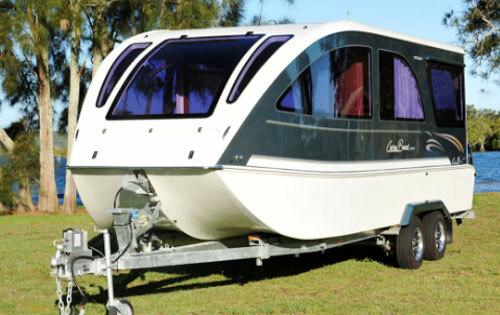 However, the opening market of “high-end” users willing to pay the price to live undoubtedly mind-blowing experience made the RV/Marine market ripe for introduction of so-called CaraBoats. It tooks few years of development but the outcome is really spectacular – a stylish, ultramodern, easy to tow trailer that can compete with (actually “outshine”) many traditional mid-range campers, but then when on the water it swiftly transforms to high-performance, luxurious motor-boat, a perfect platform to discover otherwise hidden waterways….For nature lovers as well as “romantic souls” the CaraBoat literally opens “new horizons”…..
b)	“Off-Road” RVs (especially designed models for nature lovers choosing roads less traveled…. f)	And on the opposite side of the spectrum - Luxurious RVs, reflecting the growing wealth and “appetite” of upper layers of the society. g)	And what about “exploring” foreign RV markets? Keep in mind that RV-ing is also very popular in Europe and in Australia. I’m sure you will be (positively) surprised by seeing RVs designed by foreign RV industry. Just to let you know – Australia is widely recognized as one of the leaders of “Off-road” RV-ing (think about exploring vast areas of Outback, where “off-road” truly means off-road (in other words no road)! Well, the list could go on and on, but for practical reasons we have to cut it somewhere, so let it be here…. What is the real market value of a give second-hand camper. And here certainly the Kelly Blue Book and NADA Recreation Vehicle Appraisal Guide will be very helpful. Buying from the dealer (with some warranty, but at extra charge) or from private sellers (potentially lower cost but higher risk)? Should you just rent the RV to get first-hand impression about RV-ing? Yes, you will find info where to rent an RV and what to expect! 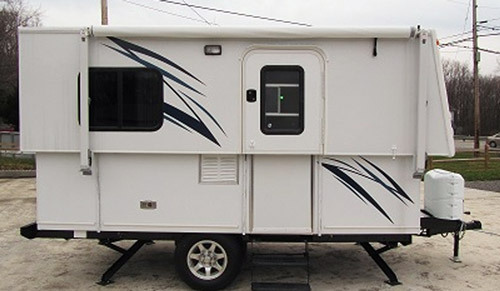 Where to buy parts for RV when comes time for replacement. Should it be an original or “substitute” part? When you can make compromise? You will find these and other topics discussed on this site, and hopefully you will also find some answers…. Once you go through the whole buying process the next question arises: Where to go? 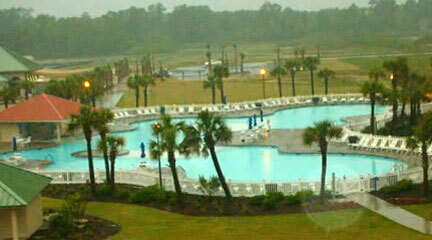 And once again, you will find on this site information about Camping Parks in US and Canada. And keep in mind – RV-ing is not only about contact with the Mother Nature. It is also an opportunity to meet people from all over the country (if not from all over the world). From our experience, meeting people from different cultures and backgrounds has been a very educational and enlightening experience. Spending time together with them in a relaxed and leisurely atmosphere has always helped us to appreciate each other in a totally new light. At the end of the day, it is all about having a nice time with the people you care about and love the most in your life. Our RV was one of the best vehicles that helped us achieve that. We have had some of our most memorable experiences in our lives while vacationing in our campers. We have acquired some of our closest friends as well through our camping adventures. This lifestyle has totally revolutionized and enriched our lives over the years. Until you start camping on your own, you will never realize how much fun you have been missing all these years. We put up this site not only to provide information, but also to gather information from experienced campers who would like to share their experiences and knowledge with others. So you are most welcome to add value to this site by sharing your Opinion Camping Stories, your thoughts, suggestions, comments, Camper Reviews and your experiences with all of us.